#1 Medfield (14-1-5): The Warriors spent most of the first half of the season ranked #1 in Mass D2 and for good reason. They are a solid squad, certainly capable of reaching the Garden. Medfield can also score, led by veteran seniors Matt Treiber (21-21-42) and John McLean (18-17-35). Freshman Brian Abely (9-18-27) has been a welcome addition. Sophomore Ryan Johnson (12 pts) will contribute. The defense will look to senior Nigel Reiff (12 pts), senior Jonathan Seibel (9 pts) and senior Michael Walsh (8 pts) for leadership in front of senior goalie Matt Malvese. These are the six Order of Light Award recipients and their parents at the Pack 200 Blue and Gold Banquet at St. Edwards. 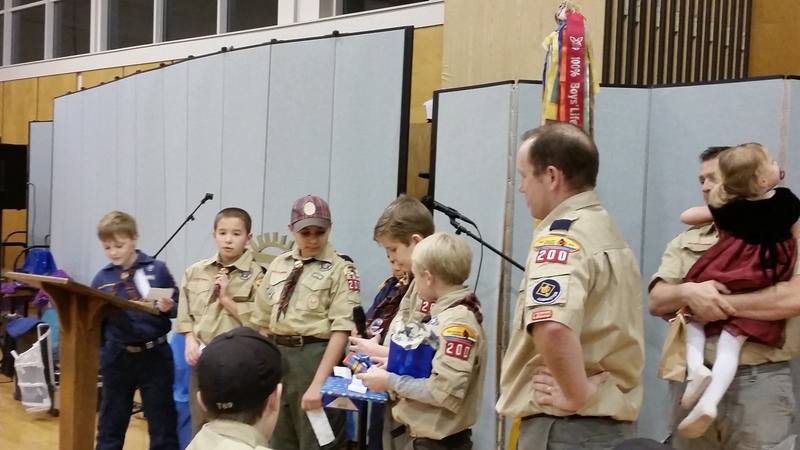 Jim Hatch retired tonight as the Cubmaster of Pack 200, clearly having done great things. Here the scouts from his den thank him, and remember the highlights. 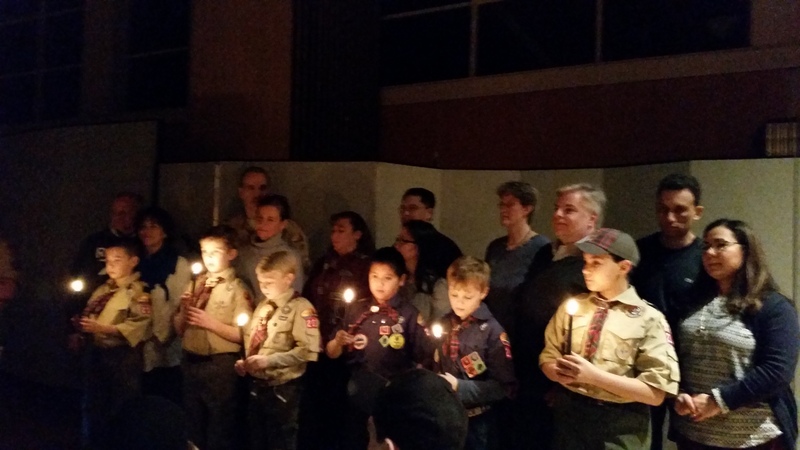 Jim’s retirement is illusory, as he is slated to replace Bruce Raine as the next Scoutmaster of his son’s BSA troop in the next few months as his son transitions to to Boy Scouts. Bruce has been the Scoutmaster for the past three years. 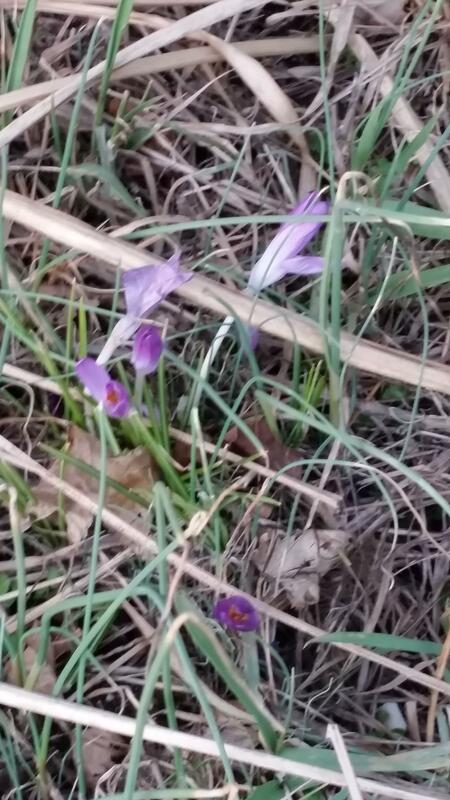 This crocus has been blooming for the last two weeks, in our bed that faces directly south. Always the first area for blooms. So as part of my new more educated posting, I have posted below jpg’s of the agenda, but embedded in the last jpg as alternate text the wording of the entire agenda, so as I understand it, the post should be word searchable. Let me know if I got any of it wrong. Attached and below are the analysis of the $1.4m. cost of the replacement MHS field the schools are asking for at the annual town meeting. I suggest viewing the PDF so the columns of figures line up correctly. that a trench and slot drain are added to the perimeter of the track to assist with drainage. The synthetic track has clear base issues at the long-jump triple-jump areas. It is highly recommended that the “D-Zone Areas” are built to include synthetic track surfacing which will also assist in the function of the areas when running track meets. The track has been over-sprayed once to date. The track has reached an age in which it should be sprayed again. This should occur during this process. It should be noted that a track can only be sprayed a minimum of three times which should make the track functional for an additional five to six years. This page lists a summary of the “Order of Magnitude” costs for upgrading the existing synthetic turf field and track at the high school. Provided are three alternates which the town should consider in making its decision in replacing the field. • Alternate #1: A higher grade of synthetic turf which is a mixture of a monofilament fiber and a slit film fiber reducing the splash of infill during play. This turf will have a face weight and more fiber which will provide a product which will perform well and stand up to the rigers of use. Additionally, it is recommended that a coated sand infill would be used. The coated sand provides an infill system that creates a firm, fast playing surface. The use of coated sand and the current warranties allow for an infill that can be reused for up to two cycles. Lastly, the alternate includes a shock pad. The shock pad provides absorbency within the field structure. This will reduce the overall Gmax in the field. Current warranties include a maximum Gmax for the life of the warranty which ranges between 20-25 years. • Alternate #2: A standard 2” turf with SBR Rubber and Sand Infill. Included in this alternate is a shock pad. • Alternate #3: Includes 5 storage units with concrete pads. An allowance for upgraded athletic field equipment.